I've got a middle class setup on a poor man's desk. Sorry about the bright lighting masking my lights, it's daytime and I have a giant sliding door in my room with curtains that don't block light. 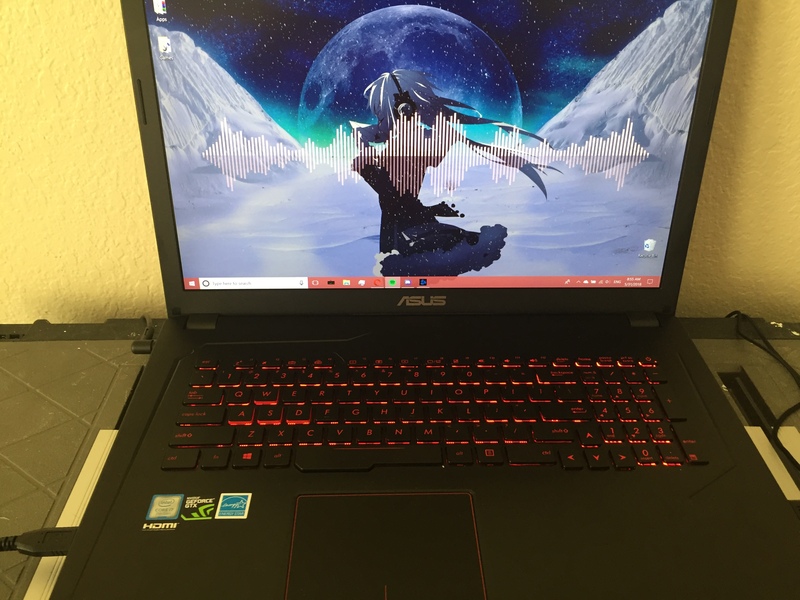 First off, we have my baby, my ASUS FX73VE-WH31, with a 1050 Ti, i7 7700HQ, and 16 GB DDR4 RAM. My own little graduation present to myself! I've configured Simplistic Audio Visualizer on Wallpaper Engine to have a nice little visualizer on my desktop! 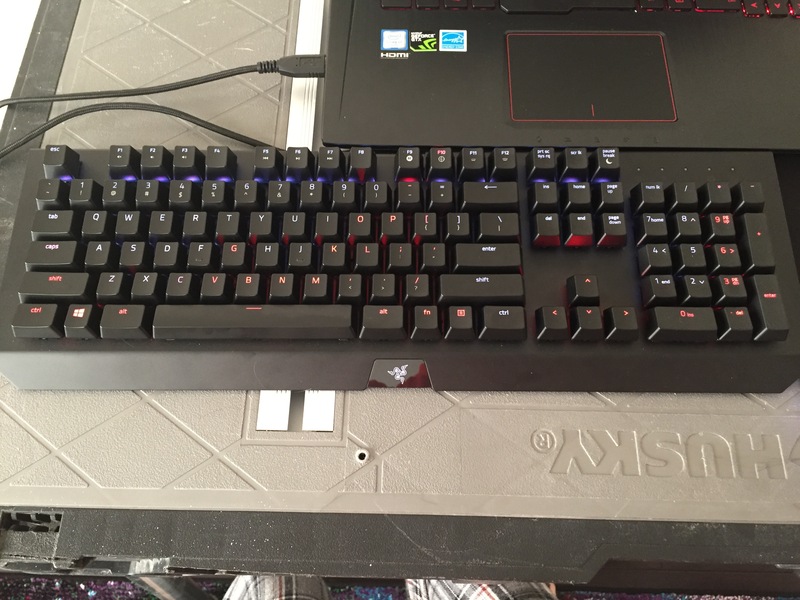 Moving down, my Blackwidow Chroma X! I was super excited to get this bad boy, and it has not disappointed me at all! The metal body looks and feels great, and i know that it'll be super easy to clean if I ever need to! I would have preferred a keyboard with a stealthier key type, but Fry's only had keyboards with Razer Greens in stock. Oh well, I still love it! It, and the rest of my Chroma peripherals, are running with the Keyboard Visualizer 3.05, I love this program so much! To the right a little are my mouse-related peripherals, my Mamba TE and my Firefly Cloth Edition! After using the back of a spiral notebook for the past 6 or 7 months as a mousepad, the Firefly feels like a dream come true, honestly! The Mamba's Chroma options vastly surpass those of my previous Deathadder Chroma. while also feeling much better in my hand, and both also run on the Keyboard Visualizer! 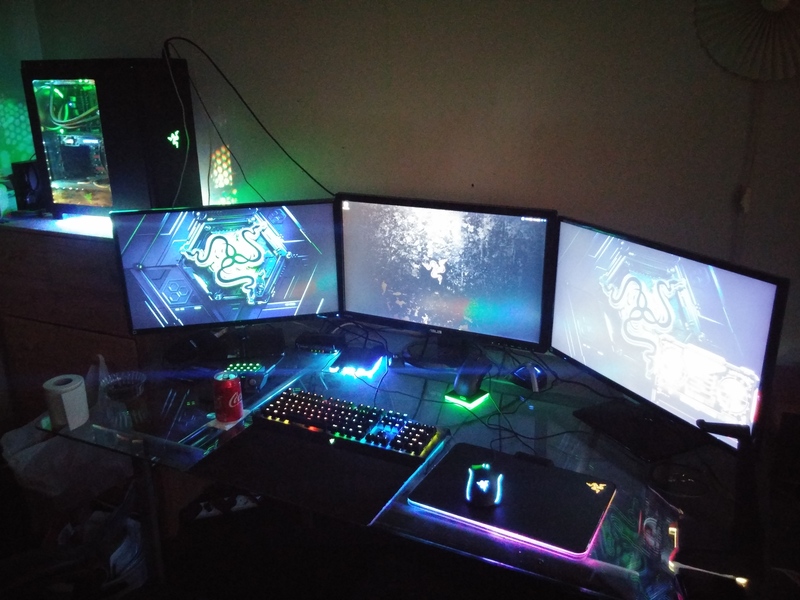 I'm getting a real desk in the mail here within the next week, and I plan on using the HDK (which I still need to order ) to set up the light strips under the top of the desk, which is made of tempered glass, and use Keyboard Visualizer to create a real light show in here! You can count on seeing that here whenever it happens, but I hope the current setup looks at least somewhat visually appealing! 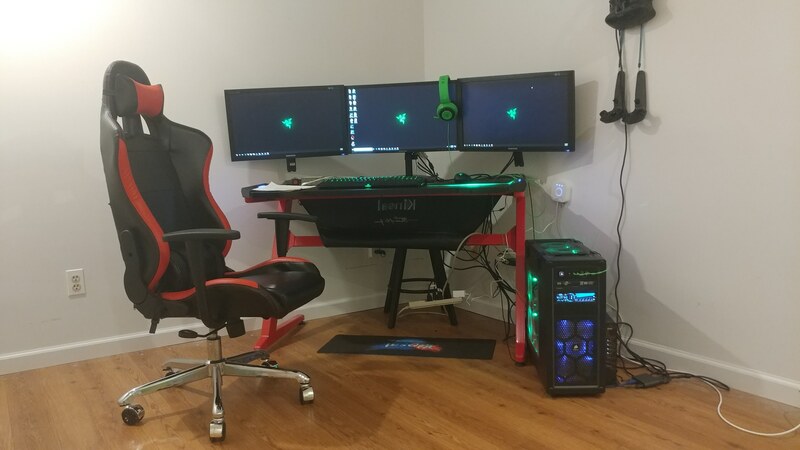 Update on my setup! I no longer have a poor man's desk, and have now set up the HDK! Check it out! Parth1C, uppakk, Ginja and 6 others like this. Nullafi, uppakk, Ginja and 12 others like this. FireFly is comming to replace this mousepad!. Ginja, uppakk, frankthetank305 and 3 others like this. For some reason, I can't even register my battlestation in my profile. 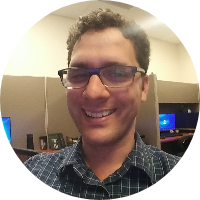 Not sure why, but if there by chance were someone who could look into that and help me out, I'd love to give back by showing you my new gear and the bridge of my new battleship as soon as it launches in a week or so. So... please, help? 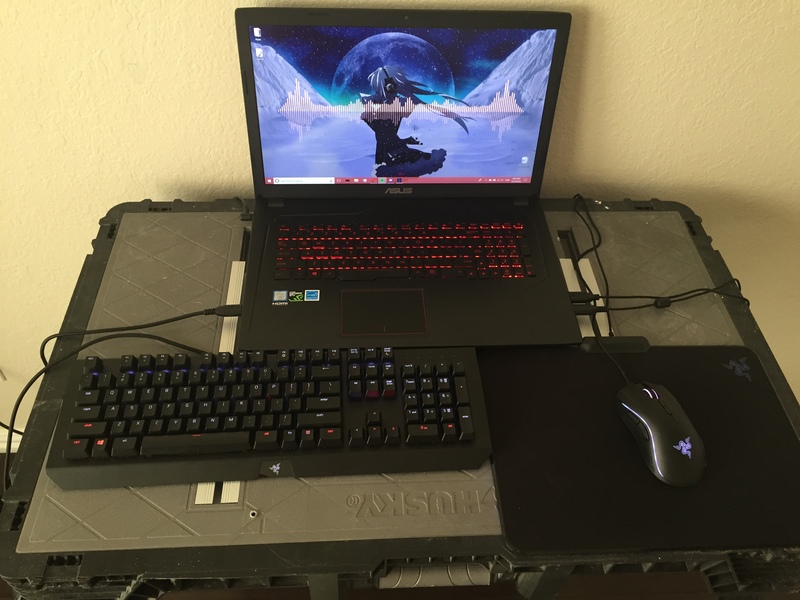 This is my Ex-Mid End setup where I'm lazy to talk about... But who cares? 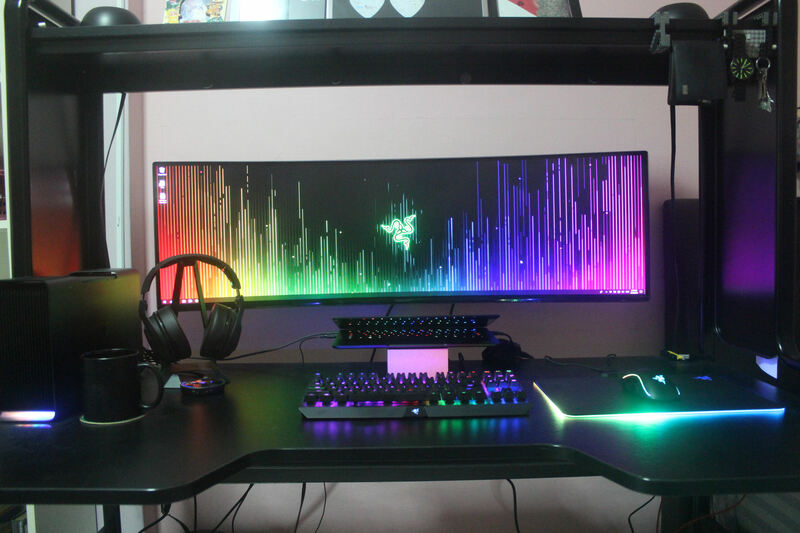 Anyway going to upgrade on next year, if the plan go smoothly~ SO let's move to Razer peripheral! 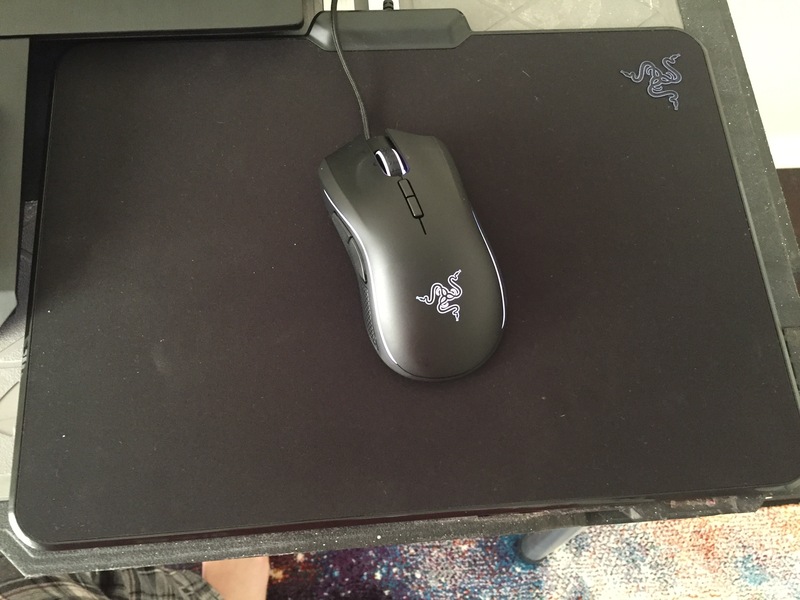 Oh, tell you what, my mouse mat is Razer too! This Razer Manticor are so dull... However, it really a beast too! The aluminium body with stable base, well, feels so luxury! 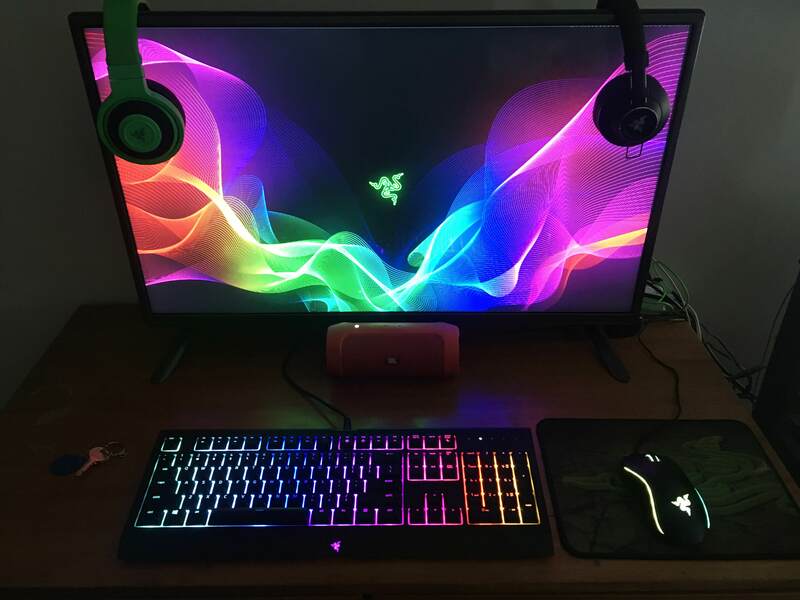 I won't change it even I got a Razer Firefly (TBH, I use Firefly as decoration in future~). Ah, there is a little greenny is freebie I got from RAZER AFK MALAYSIA! Use for cable managing my Razer Hammerhead V2. That's all for me~ But the collection haven't end! It just get started! Parth1C, spacedragon421, the.jester and 1 other person like this. Ginja, uppakk, spacedragon421 and 3 others like this. Just finished the case upgrade. Ginja, uppakk, JnK88 and 6 others like this. 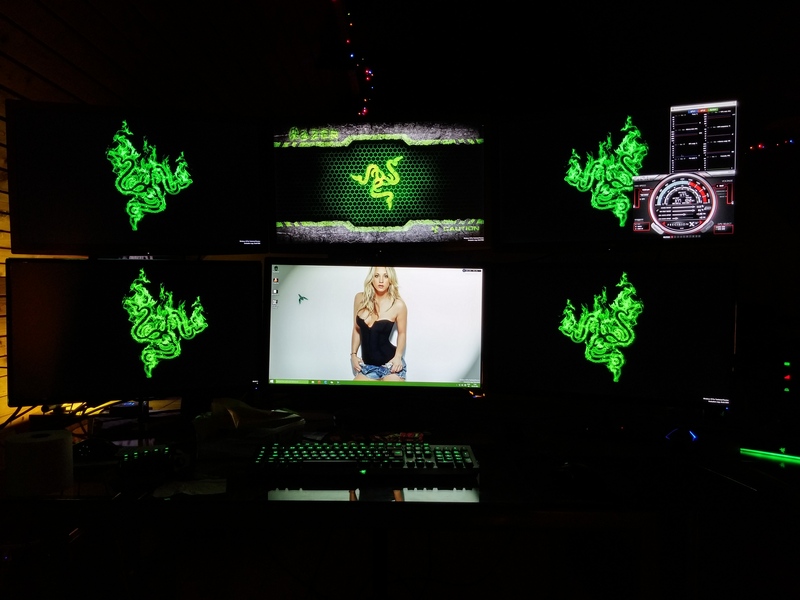 And doesn't look at the cable management I think, i need a nice picture on my wall..maybe a Razer picture?! Ginja, uppakk, mateuskater and 5 others like this. posting for the trophy, if you don't mind can you hit the like so I can get the trophy for likes as well? Ginja, Parth1C, JnK88 and 7 others like this. mateuskater and spacedragon421 like this. Lavatnt2955, Ginja, ricstar and 10 others like this. -Phillips Vue Integrated Into Synapse. Lavatnt2955, Ginja, ricstar and 7 others like this. 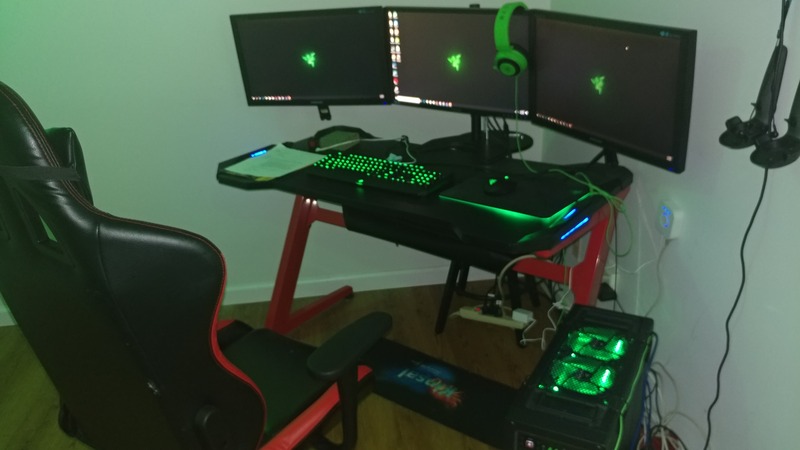 Here it is, my set up! Lavatnt2955, Ginja, ricstar and 6 others like this. 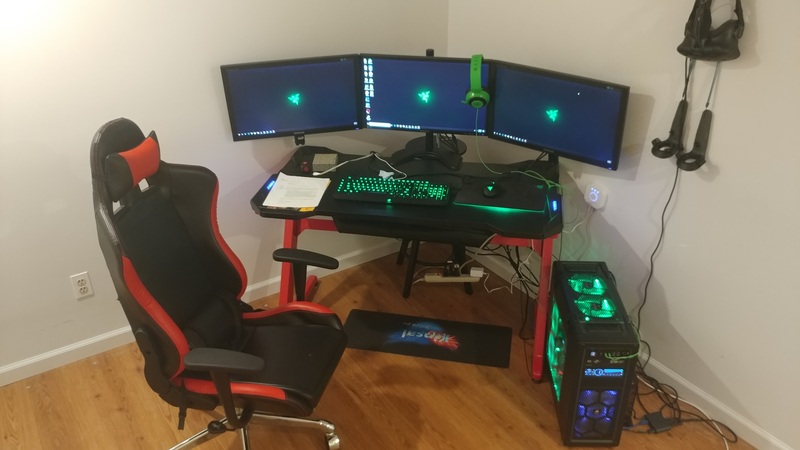 This is what my current battlestation looks like, am planning on slowly making upgrades and adding more to it later on. Parth1C, uppakk, Thorj and 1 other person like this. Posted in another thread but can't seem to find it now. Since i was forced to move i had to downgrade. 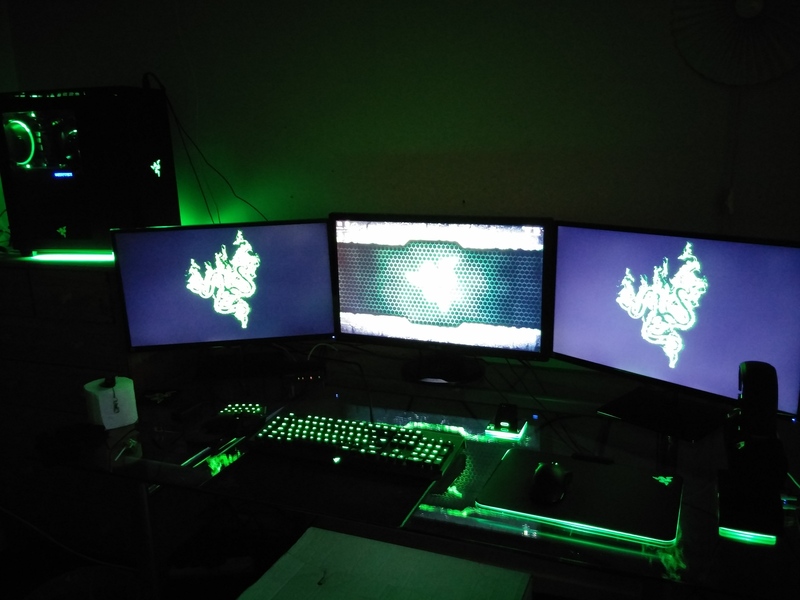 But the green looks really sweet at night. And recently i caught the chroma fever. I apologize for poor image quality. If I woke up to this. I would ask my self. Am I in heaver already lol. JnK88, Parth1C, the.jester and 1 other person like this. Ginja, Thorj, Parth1C and 3 others like this. 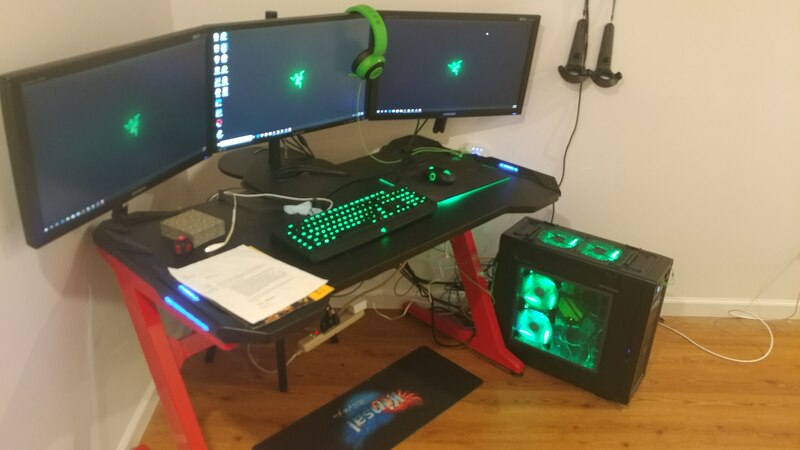 Upgraded my Monitor and headset, and re-did my wire management! Lavatnt2955, Ginja, Thorj and 3 others like this. Thorj and Limzui like this. 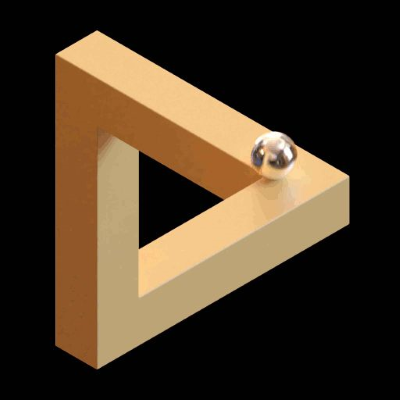 KTheory, ARMOR_152, Thorj and 4 others like this.